The 4-day trip will give you anunforgettable experience with interesting tourist sites in the central area of Vietnam. This trip route encompasses no less than two UNESCO-designated World Heritage Sitesand unforgetable wonderful destinations:The sixteenth century silk route trading port of Hoi An; My Son Valley, the sacred remains of the ancient Cham civilization, and the intact ancient imperial city of Hue; theblooming Danang city, recognized in 2016 by Smart Travel Asia as the most attractive festival destination of Asia and the world’s top 10 destinations of relaxation. Warmly welcome at Da Nang airport after you take a flight . Have lunch in a local sea food restaurant on one of the top 7 beautiful beaches in the world and then start to enjoy sightseeing of the beauty of East Vietnam Sea before heading to the ancient town of Hoi An. · On the way to the ancient town of Hoi An where is known as an UNESCO World Heritage Site since 1999 visit Marble Mountains - One of Vietnam's most popular attractions where you can discover a complicated system of caves and tunnels, special Buddhist sanctuaries and many legendaries concerned.The Marble Mountains (Ngu Hanh Son) consist of five craggy marble outcrops topped with pagodas. Each mountain is named for the natural element it’s said to represent: Thuy Son (Water), Moc Son (Wood), Hoa Son (Fire), Kim Son (Metal or Gold) and Tho Son (Earth). Upon arrival in Hoian, have dinner in a local restaurant. Check in hotel and overnight in Hoi An. 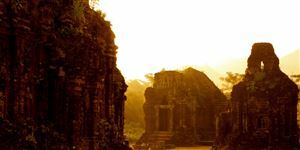 · After breakfast, begin the day with an excursion to My Son, Vietnam’s most evocative Cham site recently named by UNESCO as a World Heritage site. My Son Holyland - the former capital of the ancient Cham civilization that ruled Central Vietnam from the second to the thirteenth century. The complex is comprised of seventy Hindu-like towers and temples dating from the second century. The Cham people considered this area, in the shadow of Cat’s Tooth Peak, the domain of the Gods, and it served as the religious and intellectual center of the culture. · Have lunch with famous specialties of Hoian food in boat floating restaurant on the way back to Hoian. 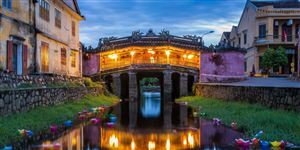 · Then explore the Hoi An ancient town such as take a walking tour visiting Fujian Assembly Hall, Tan Ky old house, Japanese Bridge, Sa Huynh Culture Museum. Continue exploring Hoi An silk village, seeing how silkworms are taken care of and how their cocoons are transformed into beautiful and elaborate handicrafts. · Dinner at a local restaurant. Free at leisure and explore Hoian at night. · After breakfast, pick you up and transfer to Ba Na Hills Station. Ba Na hills which is known as the “Pearl of the climate” of the Central, is one of the tourist center - famous resort - highest level in Indochina colonial times. · Have a chance to ride on a modern system of cable cars which helps you get a bird's-eye view, very miraculous and attractive while enjoying a feeling of flying in the blue sky amidst the clouds and wind. 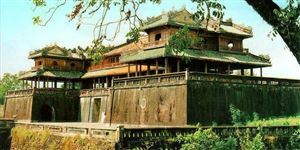 You will visit some old French villas en route, as well as the suspension bridge, the Nui Chua with Mountain Peak (at the height 1,487m). · We will then enjoy buffet lunch whilst taking in the spectacular views. 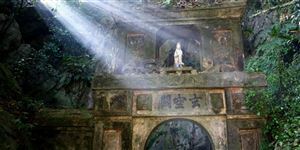 · You can visit Vong Nguyet hillsat your account where the wine cellar, Linh Ung Pagoda, Sakyamuni Buddha's monument situate (Optional). Back to Da Nang. Free shopping at local specialty supermarker. Breakfast and check out the hotel. Enjoy Vietnam typical coffee before transferring to the airport for your flight home.